This edited article about music originally appeared in Look and Learn issue number 864 published on 5 August 1978. The one thing Richard Wagner want ed most in the world was a son. He was delighted when his wife, Cosima, presented him with one, and determined to mark the event and reward her in a very special way. As a composer, he felt that the best gift he could bestow would be a new musical work – one which, he said, would be a song of praise to Cosima and their baby boy, Siegfried. For the next few weeks in that winter of 1870, he worked in seclusion in his study. Shortly before Christmas his latest masterpiece – a fifteen-minute long lullaby – was completed. He called it the Siegfried Idyll in honour of the baby, and declared that his family’s life would henceforth be as idyllic, or happy, as the title of the orchestral piece. This edited article about America originally appeared in Look and Learn issue number 864 published on 5 August 1978. 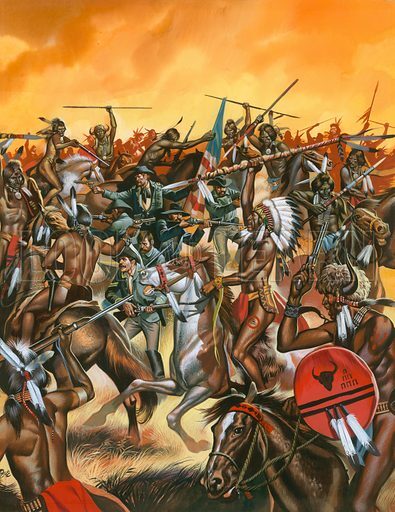 On a blazing June day in Montana in 1876, more than 200 men of the 7th United States Cavalry, led by their glory-hunting commander, George Armstrong Custer, blundered into a huge concentration of Sioux, Cheyenne and Arapahoe Indians under Sitting Bull, Crazy Horse and Gall. After a ferocious fight against overwhelming odds that lasted about an hour, Custer’s entire command was wiped out and not one white man knew that it had happened, not even the rest of the 7th cavalry, led by Major Marcus Reno, who were fighting stiff opposition several kilometres away. Custer’s Last Stand, as that desperate battle on a ridge above the Little Bighorn River is usually called, was to become an almost legendary event which has been argued about ever since; but that June evening the dead lay unburied as the thick pall of gunsmoke that had hung over the battlefield thinned out and then vanished into the summer sky. 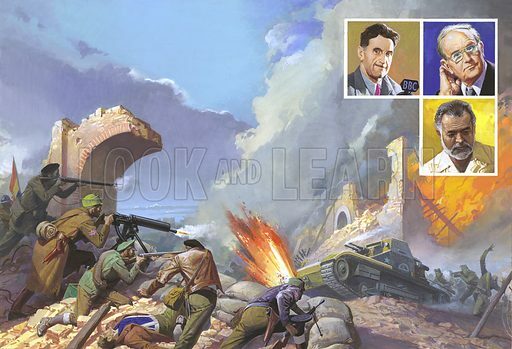 It was 25th June, 1876, and the Indians had won their most famous victory, as the world was very soon to discover. This edited article about English history originally appeared in Look and Learn issue number 864 published on 5 August 1978. There are a number of anglers in East Anglia but this is not the reason for the area’s name. Originally this was the Eastern territory of the Angles, who were forced to leave their home in Angeln, in Northern Germany, at the end of the 5th century. These were the people who, with their neighbours, the Saxons, came to settle in Britain after the Romans had left, and gradually forced the original Britons westwards into Wales and Cornwall. The Angles were a fair-haired, aggressive race who conquered large tracts of England – indeed, the word “England” simply means “land of the Angles”. They divided the land they conquered into several areas, of which East Anglia was the only name to survive. But this territory was further divided into two kingdoms: one to the North, where the nord folc lived, and one to the South, where the sud folc lived. These names have also survived – they are our modern Norfolk and Suffolk. This edited article about the industrial revolution originally appeared in Look and Learn issue number 864 published on 5 August 1978. Have you ever wondered why an unmarried woman is called a spinster? 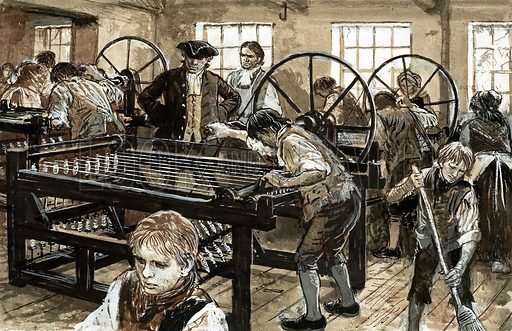 The reason is that before the Industrial Revolution transformed England in the 18th century, the manufacture of wool was a “cottage industry”, which means that instead of going to factories as they would today, people (usually women) produced thread on simple equipment in their own homes. The process of making wool into thread is called “spinning”, which is where the fibres of raw material are wound together to make a thread. Since it was mainly women who were occupied in the industry, they were called spinsters. However, in 1769 a man named Richard Arkwright decided that it must be possible to produce thread more efficiently. The cottages were often spread out over the countryside and the end product was often widely different in quality. He therefore made spinning machines driven by water-power, and put several of them in a factory which he built on the River Derwent at Cromford, in Derbyshire. The combination of having several machines under one roof, and the extra power obtained by using water, meant that he was able to make a dramatic increase in the quantity and quality of the thread produced. Sir Richard Arkwright (he was knighted in 1786) is not so much famous for his invention of a spinning machine (many of the ideas for which he seems to have “borrowed” from elsewhere), as for his introduction of a factory system, without which the Industrial Revolution could not have been achieved. In this, Arkwright was a pioneer. He died in Derbyshire on 3rd August, 1792, leaving a large fortune. This edited article about civil aviation originally appeared in Look and Learn issue number 864 published on 5 August 1978. On 30th May, 1912, a man in the German city of Neuss was looking up at the silver-grey airship Viktoria Luise that was cruising above his head, but he failed to notice a lead-weighted postcard that fluttered down from it. Nor did he pay much attention to the clucking as this early form of delivery by airmail landed in his chicken-run. 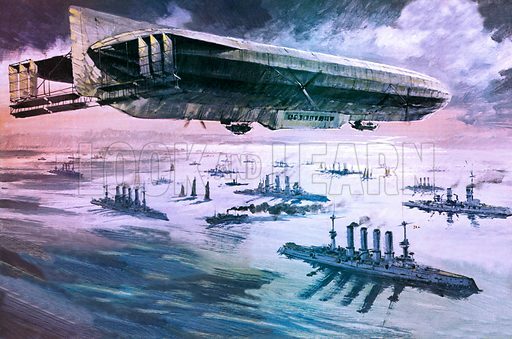 Before the First World War, Germany’s huge airships gave her a real lead in passenger aviation, although the Zeppelin’s version of “airmail” was unreliable to say the least. Nor were the passenger flights on airships like Schwaben, Viktoria Luise, Hansa and Sachsen a proper scheduled service. These flew over most of the country but were more like excursions than a regular service. Nevertheless, between 1910 and 1914 the DELAG company that ran them made 1,600 flights, covered 145,000 kilometres and carried 34,000 passengers without a single mishap. This edited article about Captain Bligh originally appeared in Look and Learn issue number 864 published on 5 August 1978. It must have seemed to 17th-century sailors when they dropped anchor at the Pacific island of Tahiti that the bread-fruit tree was God’s special gift to mankind. For centuries men had prospered or suffered, grown rich or died, on the results of the annual harvest, just to have enough bread, their staple diet, for everyone to eat. Now, on this sun-blessed island, bread actually grew on trees – and required no greater bother before eating than the act of picking and baking it. This edited article about plants originally appeared in Look and Learn issue number 864 published on 5 August 1978. Plants make their own food from air and sunshine, the chlorophyll which is present in their leaves, and a plentiful supply of water and minerals from the soil. But what of the plants that catch animals and use them as food? 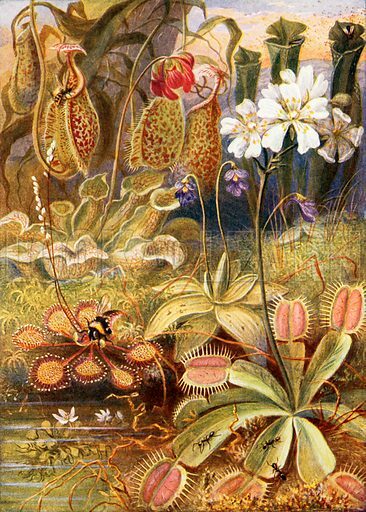 Carnivorous plants, as they are called, normally have green leaves with which they make their food, but often they grow in bogs and marshes or in poor soils from which it is difficult for them to get enough minerals to live on. When this is the case, the plants trap animals and use them as a source of food. All carnivorous plants possess a bait and a trap. Obviously a plant can never go in search of prey in the way that a fox or a shrew can. The carnivorous plant makes the prey come to it. 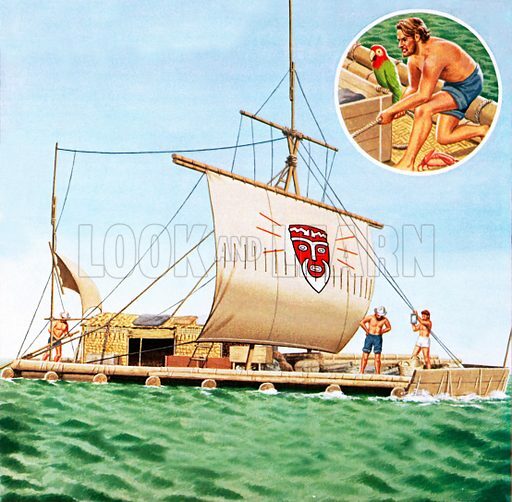 This edited article about Kon-Tiki originally appeared in Look and Learn issue number 864 published on 5 August 1978. Sadly the experts shook their heads when they saw the raft of nine huge balsa logs lashed together with hemp rope. “The logs will become waterlogged and the raft will sink when you take it to sea,” they said. “After a fortnight every single rope will be worn through by the movement of the big logs rubbing against each other,” said others. But Thor Heyerdahl, a Norwegian explorer, refused to be deterred by their gloomy predictions from his intention to sail a raft across the Pacific Ocean from Peru to the South Sea Islands, a distance of over 6,400 kilometres. Heyerdahl was making his journey to prove his theory that the brown-skinned people who lived on the South Sea Islands must have come from Peru in South America. He and his companions built a raft of the kind the Peruvians would have made. On the sail they painted the face of an Inca god, Kon-Tiki. Their frail craft, which was to brave rough seas and danger from dolphins, whales and sharks, was towed out to sea from the naval dockyard at Callao on 28th April, 1947. On the first day out, the wind blew at full strength and the waves were large and formidable. The crew clung desperately to their steering oar, fighting against the powerful currents to stay on course. Eventually, after three days, the sea grew calmer and the crew crept into their little bamboo cabin to sleep. 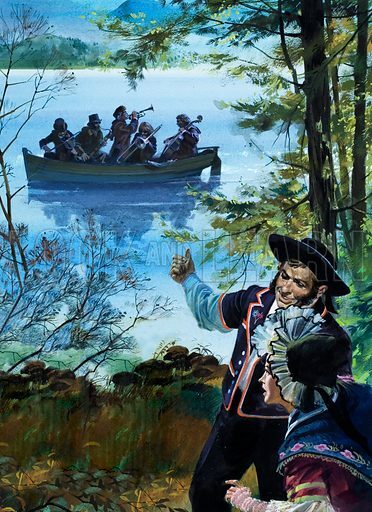 They settled down to their long journey and, after 101 days, they saw an island. 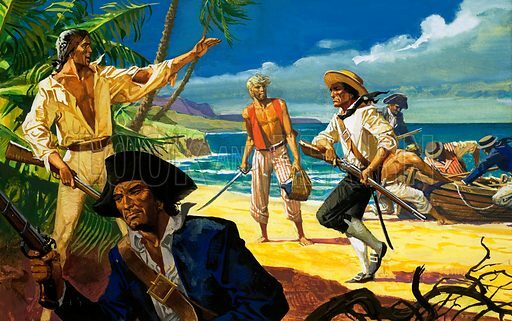 As they came near to the island (which they discovered was east of Tahiti), the swell grew heavier and heavier. Kon-Tiki disappeared under masses of water. Then there was a shudder as it hit a reef. In a few seconds, the raft had become a wreck. Everything above deck was smashed, but the nine balsa logs were as intact as ever. They had saved the lives of Thor Heyerdahl and his crew and enabled him to prove his theory that the Peruvians, in ancient times, could have crossed the Pacific to the islands of the South Seas. This edited article about wildlife originally appeared in Look and Learn issue number 863 published on 29 July 1978. Stealthily, the hunter crept through the forest in Madagascar. A rustling in the branches made him look up and there, hastening away for safety, was a monkey-like creature with long, lithe limbs and a face like a dog’s. 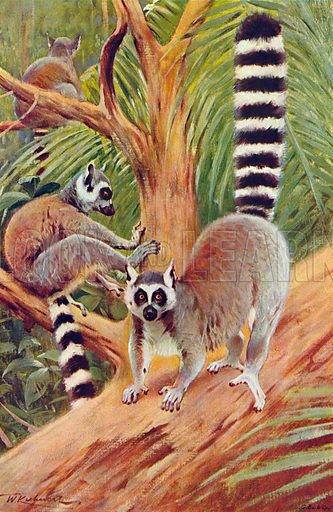 It was an indri, a member of the lemur family. Raising his spear, the hunter was preparing to throw it when a half-forgotten tribal legend raced through his mind. He had heard the fathers of his tribe say that an indri was sacred. For this reason, it should not be hunted. And if a hunter were foolhardy enough to throw a spear at it, the indri would grasp the spear and hurl it back at the hunter. Perhaps such legends were true, he thought. In any case, he decided to take no chances and went on his way – and the indri was saved by a legend. This edited article about English literature originally appeared in Look and Learn issue number 863 published on 29 July 1978. He was educated at Eton, but spent periods of his life as a dish-washer, hop-picker, and tramp; he hated anything to do with the Establishment, yet joined the Burma police; he fought side by side with the Communists in the Spanish Civil War, and yet wrote a savage novel attacking Communism; he was always preaching that we should all learn to become Europeans, but there was nothing he liked more than a simple English meal washed down with strong English tea; he was an intellectual, but one of his most cherished books was a children’s novel, The Swiss Family Robinson. His name was Eric Blair, and he is better known by his pseudonym of George Orwell. He was the bravest and most attractive of personalities, even though he once described himself as being weak, ugly and cowardly.